Over the past few weeks, the third grader that I tutor started learning multiplication at school. Yikes I'm thinking since she is still struggling with her addition and subtraction facts. So far she seems to be doing okay and can draw a picture to help her solve a problem. That's good news! In the next few weeks, they will start their timed tests. 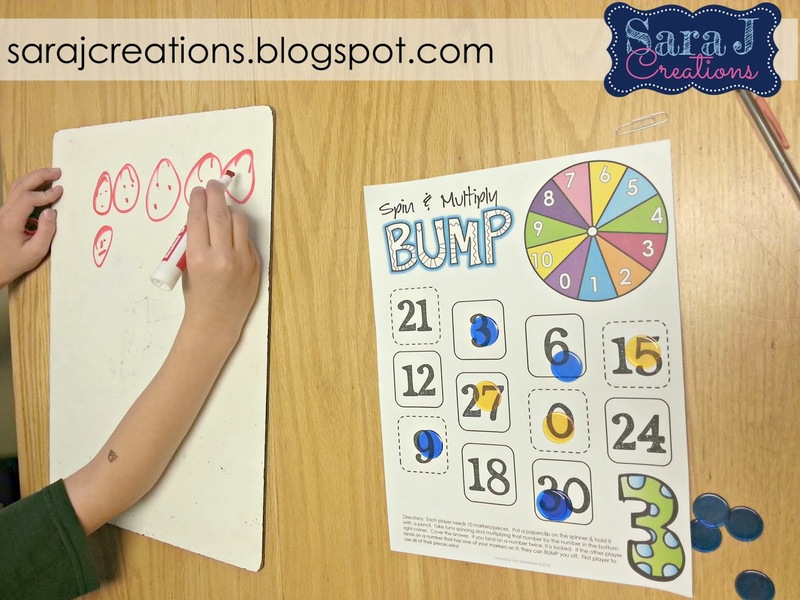 She loves playing bump so I decided to make her some bump games to practice. I thought if I made a different game for each number, I could easily pull out the game that matches the current number she is working on. Even though they haven't officially started their tests, she is working on 3's and 4's right now. Normally, the bump games we play, use dice. I thought about this but it would only allow her to practice multiplying up to 6. I thought about making a foam dice with other numbers like we did for Big Number Bump but unless I had a 10 sided dice, she wouldn't be able to practice all of her facts. I decided to add a spinner instead. 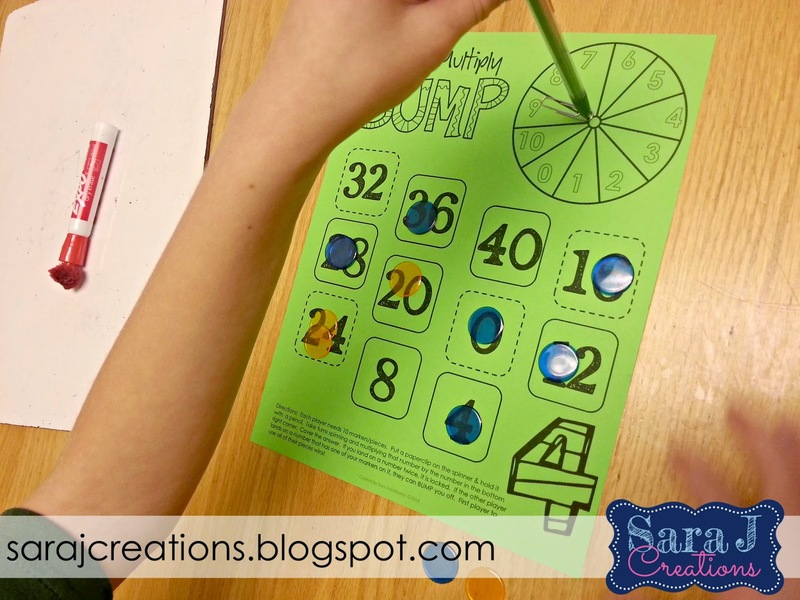 The girls I tutor loved using spinners (just a pencil and a paperclip) during the summer on the homework I created for them so I thought we could spin instead of rolling in this game. Since she is still learning her facts and what multiplication is, I told her to use a dry erase board so she could draw a picture if she needed it. Other than that, the bump rules are still the same. I made the games in color and in black and white since I know a lot of teachers don't have unlimited color ink . I printed the black and white copy on colored cardstock for something a little different. 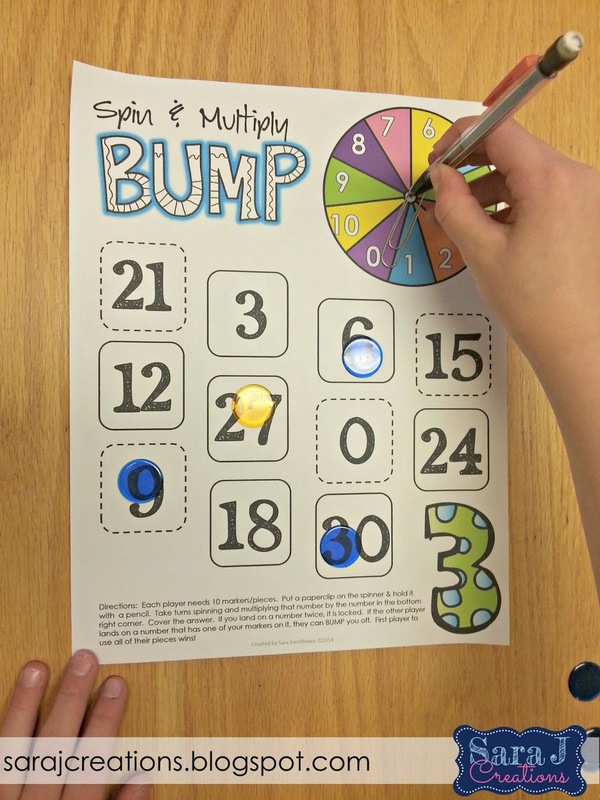 1.Players take turns spinning the spinner and multiplying the number they land on with the number in the bottom right corner of the page. 2.The player puts a marker on the answer. If another player’s piece is on there, they BUMP it off and take that spot. 3.If a player lands on a space twice and has two of their markers on a number, it is locked and no one can bump that number. 4.The first person to use all 10 of their markers is the winner. You can find this bump game in my TpT store HERE. I was all proud of myself thinking, we have new games now for the next few weeks...months even. Then she asked for Christmas bump. I thought hmmm....good idea...that is easy enough. Take the same game, with the same numbers, in the same places and just add different clip art. So I made a Fall Edition and a Christmas Edition this week. My wheels are turning about other seasons and holiday versions that I can make for this game. Even though each version is the same game, there is just something fun and new about switching them out for an upcoming holiday. Hey - if it keeps her attention and helps her practice her math facts, I'll make them for every upcoming holiday! I now have versions for the entire year. I've included all holidays along with a generic version to use any time of the year. I also have all of these available in a money saving bundle!